Solar lighting and most outdoor solar products generally use rechargeable batteries that last about two years, a pretty good life-span. Sooner or later though, replacements are inevitable. And that’s where the trouble can start. A mistake that many solar lighting users make is thinking that ANY battery will work with their solar light. Sorry, it’s just not the case. Using the wrong battery may work initially, but within a very short time it will destroy the solar lighting fixture. Solar lighting fixtures are very particularly sensitive to the types of batteries used. Why? Because a well-designed solar light depends on the integration of three major components: the solar panel, the light used (usually LED but also halogen and CFLs); and the charging feature associated with the battery. There are many technical differences between the three types cited above and this article does explore all of them. Instead, it explains some of the basic characteristics, advantages and disadvantages of the three types. Nickel cadmium batteries were one of the first types of rechargeable batteries used for solar lighting. If you want an idea about when your solar light was designed, check out the batteries. They are a a good indicator of how current other components in the solar fixture are). NiCD batteries often mean it is an older design. This doesn’t necessarily mean it is an inferior product; it’s just something to think about. Many accent lights, for example use NICD batteries because they are the most cost-efficient for relatively low cost solar fixtures. Ni-CD batteries are simple and fast to charge. Even if they have been stored for a while, an NI-CD the battery will usually take new charges well. They also are less sensitive to temperatures changes than other batteries, particularly Li-Ions.NiCD batteries also are useful for items that need high discharge rates. (Put simply, discharge rate is the release of electrical supply from a battery to the item it charges.) NiCDs are cheapest rechargeable batteries to produce and usually the most inexpensive to buy. As Ni-MH batteries and newer Li-Ion batteries came into favor, technology advances for NI-CD slowed down. Ni-CD batteries are not as powerful or as adaptable as other alternatives that were not cost-efficient just a few years ago. Most important to many folks who use solar lighting because of its “environmentally friendly” nature, Ni-CD batteries are considered hazardous materials. When Ni-CD batteries reach the end of their life-span, they must be disposed of as hazardous materials. Most municipalities have special collections or drop-off a few times a year when they will accept Ni-CD batteries and compact fluorescent lights (CFLs) along with other household hazards such as toxic paints or stains, certain cleaning products, etc. They are commonly used in electronic devices because of their affordability, long life span and high charge rate. NiMH’s are about twice as powerful as NiCD batteries and can be easily purchased in a variety of sizes. NiMH batteries are made with more affordable and less hazardous materials than NiCDs. Most specialists believe they are not impacted by “Memory Effect.” Memory effect is complicated to explain and different people use it differently. In simplest terms, it means that for whatever reason a battery does not work as well as it could or should work. Unlike NiCD batteries, they do not contain hazardous materials. And they are usually far less sensitive to temperature extremes than Li-Ion batteries. NiMH batteries were specifically designed to provide strong performance in relatively high-drain electronic devices, such as solar lighting fixtures. They have a long life (about two years or up to 500 to 1,000 charge/discharge cycles. They are light weight and maintain strong power for about 80% of the chargeable cycle, for example one full day in the sun for solar products. A main disadvantage of NiMH batteries is that they begin to lose their charging capacity when stored. An easy fix to this is to set a solar product using in the sun for two days before they are used at night, just as is recommended for new solar products. Experts agree that considerable improvements have been made in NiMH batteries but limitations will remain. In fact, many view NiMH as an “interim step” towards lithium-ion technology. Lithium-Ion (Li-Ion) batteries are viewed as “state-of-the art” in battery technology. It’s also expected that moving forward, Li-Ions will continually improve, gain more cache among electronic manufacturers, and be used more frequently. The strongest form of batteries, Li-Ions are commonly used in consumer electronics. Li-ion batteries generally have a life-span of over 500 charge/recharge cycles. They provide higher energy rates per weight. So, a Li-Ion battery of the same size and weight of a NiMH or NICD battery would produce twice as much power. Li-Ion batteries do not contain hazardous materials such as lithium, cadmium, lead or mercury. At any given wattage, Li-Ion batteries weigh about half as much as NiCD or NiMH batteries of similar power. In general, they suffer from no “memory effect” and maintain their charge even you don’t use them for long periods of time. Because Li-Ion batteries continue to evolve, they are not considered to be a “fully mature” technology. In solar lighting and other products, special circuit protection must be incorporated into the design to maintain both voltage and currents within safe limits. Many also believe that they “do not age” well, but this will improve as the technology evolves. Overall, Li-Ion batteries are considered to be the best technology. However, being the “best” comes with a cost. Not only are Li-Ion batteries themselves more expensive than other alternatives, the technology required to effectively use them usually means a higher price tag for the product as well. Worth, usually but it’s not always the best choice. Along with your budget, you have to consider what you want in terms of function and appearance. With a few exceptions, the best producers of solar technology do not always produce the widest selection or the most stylish products. It often takes a couple of years for the “best technology” to trickle down to other manufacturers. Again, batteries are just one part of a solar lighting fixture. The best battery will only work as well as the light, the solar panel and the way all components work together. For solar lighting fixtures or any other electronic products you now have, the battery specified by the manufacturer is the best. 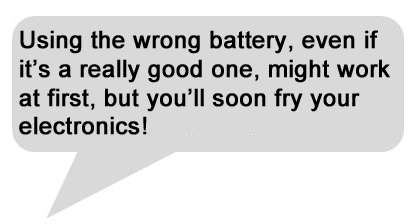 Otherwise, your batteries will just assault your electronic product. Note: use of photos of specific batteries does not mean that we endorse these products nor that we have any opinion of them what so ever, other than in the overall context of this article. We do, however, endorse Gama Sonic Solar Lamps. They’re Great! This entry was posted in Selecting & Caring for Solar Products and tagged Batteries, Solar Lighting Options by SolarLightingSmart. Bookmark the permalink.